Qantas says it has “arrested” the decline in revenue per seat in its domestic businesses as it continues to suppress capacity in response to weaker demand. In its monthly traffic statistics report released to the Australian Securities Exchange (ASX) on Monday, Australia’s largest airline group said revenue per available seat kilometre (RASK) across its domestic businesses (Qantas and Jetstar) was lower in April due to Easter falling in March rather than April this year (which also affected some states’ school holiday dates), “demand softness” attributed to the coming federal election and the downturn in the resources sector. “However, due to the action taken to reduce Group domestic capacity in the fourth quarter of financial year 2016, the negative RASK trend was arrested in April, with improved trends through May and into forward bookings for June,” the statement to the ASX reads. 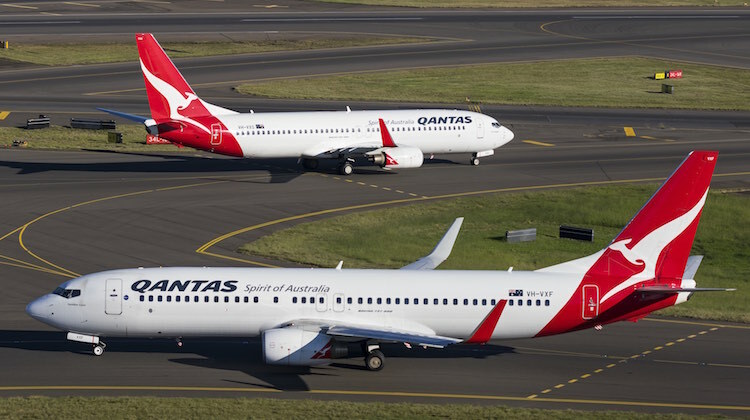 Qantas said group domestic capacity was down 0.5 per cent in April compared to April 2015, while Qantas Domestic’s seat load factor increased from 73.4 to 74.1 per cent and Jetstar Domestic’s load factor was effectively steady at 80.3 per cent (down 0.1 per cent). RASK in the Group’s international businesses was also lower. “Jetstar International RASK declined as it continued to grow into recent capacity additions,” Qantas noted, referring to the higher seat count of Jetstar’s Boeing 787-8s over the A330-200s they replaced. Overall, Qantas Group capacity increased 3.7 per cent in April, while revenue passenger kilometres increased by 6.4 per cent. As a result group seat load factor increased 2.1 percentage points to 79.4 per cent. RASK for the financial year to date “was lower” compared to the same period in 2014-15, Qantas noted, but group capacity was up 4.9 per cent and demand up 6.1 per cent, “resulting in a Group revenue seat factor of 80.5 per cent, which was 1.0 percentage points higher than the previous year”. QANTAS isn’t going to put on a ‘sale’ just to fill seats. It’s cheaper, base line, to fly an aircraft with empty seats in the cabin, rather than non-profit ‘seat sales’. Less fuel, for starters, which is the greatest cost to an Airline, after Wages to Staff. It also means more Cargo can be uplifted per plane, which brings in more revenue than ‘bums on seats’ at anytime. It takes a long time to negotiate with another country’s govt, & ours, to do so. AND Oz govt wants to make sure that other countries’ airlines get more revenue, than Qantas anyway! They let foreign carriers’ rights to here as quickly as possible, thus eroding Qantas’ market share even further. Aircraft aren’t in ‘service’ for various reasons…….engineering checks, charters, being cargo freighters, humanitarian involvement etc. Maybe you need to learn a bit more about how an Airline is run, instead of posting ‘pie in the sky’ ideas’.